Semiconductor Engineering - The End Of Automated Patent Trolls? Semiconductor Engineering - The End Of Automated Patent Trolls? Home > System-Level Design > The End Of Automated Patent Trolls? 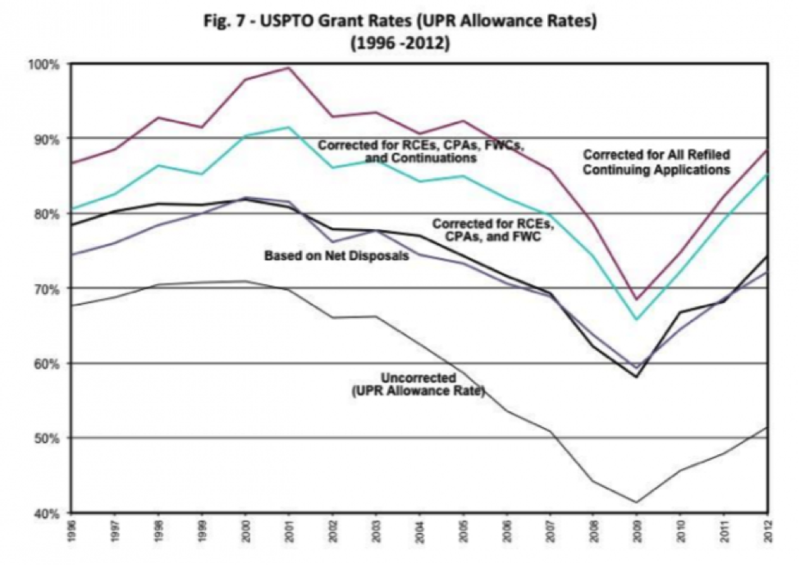 The End Of Automated Patent Trolls? IBM’s patent makes it a violation for third parties to extract value from a patent using a computer. I have written several articles and blogs recently about the Patents system, and readers of What Were They Thinking know that I like to poke fun at patents that never should have been issued because they are obvious, silly or would never actually be able to work. There are patents that cover using a laser pointer to play with a cat, to water a Christmas tree or to create perpetual motion machines. How easy is it to get a patent? I was interested to see how many patents actually get rejected and I found a study from about a year ago that provides some insight. The study was conducted by the University of Richmond. The various lines on the graph show different ways to count acceptance. For example, the lowest line corresponds to a patent that is filed and rejected three times before eventual acceptance as being four submissions and would be an acceptance rate of 25%. The higher line would count that as a single patent and an acceptance rate of 100%. I find this pretty amazing. Back in 2001 almost every application was eventually accepted and more than 70% were accepted without ever having to correct anything. That number went down but saw a rapid increase under the governance of a new head person in 2009 – David Kappos. He resigned in late 2012 and it is not clear if the trend has changed yet. This is a judgment call, for which there are almost no rules. Attempts have been made to clarify this but most of them provide little extra guidance. Consider one such case from 1966 where they concluded, “Such a combination of familiar elements according to known methods is likely to be obvious when it does no more than yield predictable results.” But predictable to whom? This again calls for judgment. A system and methods for extracting value from a portfolio of assets, for example a patent portfolio, are described. By granting floating privileges described herein, a portfolio owner can extend an opportunity for obtaining an interest in selected assets from the portfolio to a client who lacks the resources to accumulate and maintain such a portfolio, in return for an annuity stream to the portfolio owner. The floating privilege can take many forms, depending on the needs of the client and the nature of the assets in the portfolio. The privilege is executed for a set of assets selected by the client and approved by the portfolio owner in accordance with a floating privilege agreement controlling the floating privilege. So, I guess they will not be able to stop human beings acting as patent trolls because that has already been done or is obvious, but they have perhaps stopped the automation of the process. At least that is something!